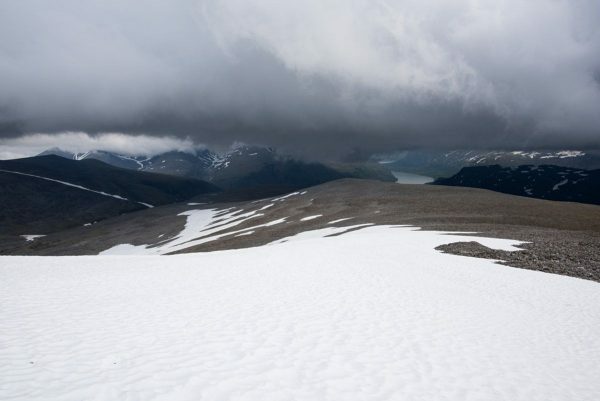 Summer started late in Lapland this year since the amount of snow fallen during winter was very high. In fact, I was told that this much snow hasn’t been around for decades. Obviously, this had some impact on my (and everyone else’s) hiking plans. Especially in early summer this lead to very difficult conditions. I started out in August, but there was still much snow left in the higher areas and the water levels of streams and rivers were high. In the image I am wearing rain clothes and gloves. Not because of rain or cold, but due to thousands of little biting flies that were all around me and covered large parts of my body. A mosquito net around my head prevented me from having a clear view of my surroundings – everything looked hazy. While the day before and in the morning there were no midges at all, they started to appear when I descended towards the valley. 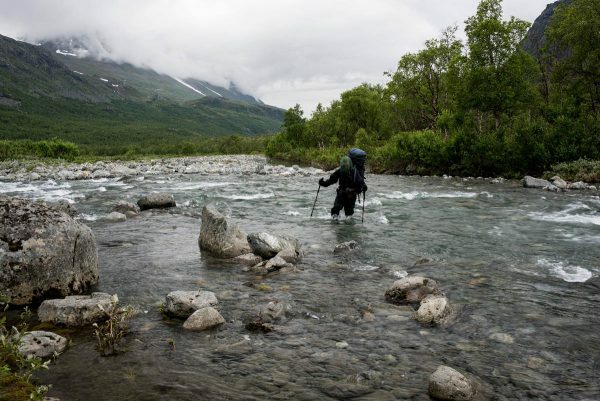 When I reached the stream depicted in the image, I had already hiked pathless for hours dressed like this – including detours through a lot of brush. I was totally sweated but did not dare to remove my clothes as I was not keen on donating my blood. I walked along the bank of the stream to find a place where it was possible to cross. Finally, I found a spot that seemed suitable. It was evident that this wasn’t going to be pleasant. I set down my backpack and put everything inside that should remain dry – including my camera in a drybag. I changed to my wading shoes (a low-cost imitation of the well-known Crocs) and decided to first try the crossing without my backpack as the depth and current of the water was not apparent. I left my rain pants on; they would dry later and protect me against the midges. The water level reached my thighs and the currrent was quite strong but it was doable. At the other bank I deposited my hiking boots. I returned to my backpack, lifted it and went into the water again. I tried to take the same route I had before. The noise of the water drowned out the buzzing of the midges – at least this was a relief. I concentrated on taking slow steps in the cold water, using my hiking poles for support. Fortunately, everything went smoothly and I was very relieved when I was finally standing at the other bank. Looking back, I decided that it would be interesting to have a picture of this endeavour but this meant going in again – with backpack of course. Well, it couldn’t get worse, could it? So I mounted my camera on a tripod, put the remote trigger in my pocket and went into the water. I did not go to the deepest place – I deemed this to be too dangerous. When I had found proper footing and I took out my remote release and triggered the shutter. After being back I am really happy that I went through all this and got this image. It serves merely documentary purposes but I really like it because it reminds me of my adventure.